Did you know that there is no legislation governing car seat accessories? While car seats are rigorously tested, most car seat accessories aren’t. But we are parents first and the safety of children is paramount to us. The Morrck Baby Hoodie is classified as clothing and as such, it is not required to be crash tested. For our own peace of mind, however, we have tested it using the same test conditions used to measure the safety of child car seats in Europe. The Baby Hoodie has been tested on a range of different types of child car seat using UN Regulations 44.04 and 129.00 (often referred to as the i-size regulation) test conditions. The requirements of Regulation 44.04 or 129.00 were met in all tests. The testing was completed at TRL in Berkshire, UK. The Transport Research Laboratory test centre is an internationally recognised centre of excellence providing world-class research, consultancy, testing and certification for all aspects of transport. Before undertaking any testing we took extensive advice from the Department for Transport (DFT), the VCA (part of the DFT) and VOSPA. After much discussion and taking into consideration all the advice we had been given, it was decided that on the basis that all car seats must comply with the same standards, successful results should show that the standards for harness safety remained within UN regulations 44.04 and 129 (i-size) specifications as appropriate. The All Season Baby Hoodie was crash tested in the following car seats under the strict conditions of UN Reg.44.04 and Regulation 129.00 (i-size). The requirements of Regulation 44.04 or 129.00 were met in all tests. For a car seat harness to work properly, the straps need to be tightly strapped against your child’s chest. When a child wears a snowsuit or thick coat, the straps are usually adjusted to the thickness of the coat, not the chest. If you had to stop suddenly or the car was in an accident, the coat could compress, making the straps too loose which would reduce the level of protection for the child. Find out if harness tension is correct or if a coat is too bulky for in-car use? Put the coat on your child. Strap your child into the car seat and tighten to ensure a snug fit. Remove your child from the car seat – leaving the straps exactly as they are. 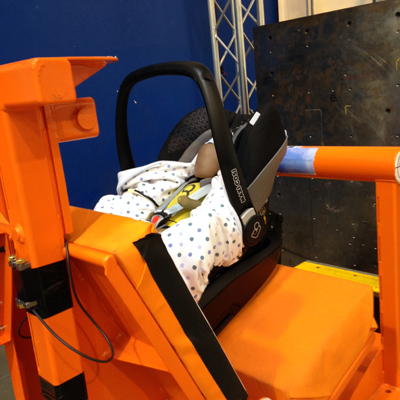 Strap your child back into the seat – without adjusting the straps. Watch this video on how to do the test and see how much slack a thick coat or snowsuit can cause in your child’s safety harness. You will be amazed! You can do this same test, but instead of testing with two fingers at the collarbone you can just pinch the harness and if there is any slack tighten the harness until you can’t pinch anything. If you do choose to strap your child into their car seat wearing a coat, you must ensure that the straps are pulled very tight for them to be safe. This will have an impact on the child’s comfort and freedom of movement. You can be sure that you’ll hear complaints from the back seat! To test how much movement is restricted, adjust your child’s car seat harness so it fits securely only over indoor clothes. Then try to put your child in whilst they are wearing a coat. It’s near impossible. This normally results in parents loosening the straps, which stops complaints from the child, but means they’re no longer securely strapped in. Simple solution. Lose the coat! Coats in car seats can also quickly cause overheating. For babies, unable to tell you what’s wrong, this can be dangerous. It is safer to use something that is removable – whether it’s a blanket or coat popped on top of them, or a product like our Baby Hoodie car seat wrap, which can be opened up easily. Did you know that there is a reason the car seat harness release button is red? It’s so that it is easily visible in case the child needs to be removed quickly in an emergency. Whatever product you use to keep your child comfortable in their car seat, ensure that it provides easy access to the harness release button in an emergency. The more zips, clips or Velcro involved, the more difficult it is. It’s for this reason that the Baby Hoodie car seat wrap simply tucks over the baby, with no additional fasteners. Why is harness tension an issue? You might be wondering why you’re only just hearing about this. In the USA and Canada, the issue of harness tension and thick coats is a subject that’s been discussed at length for many years. Parents in these countries are strongly advised not to let their children wear thick winter coats in car seats. Increased awareness of this issue has been led by qualified car seat safety technicians. In the course of their training they are shown examples of what can happen to children if the harness is too loose. There is one particular image that is used where the only thing remaining in the car seat following an accident is the snowsuit. The infant had been thrown from the seat. It’s no wonder they are passionate about raising awareness. With our recent colder, snowier winters in the UK we also need to make sure we keep our little ones as safe as possible. if you are unsure that the car seat harness is fitting correctly over a thick coat, just lose the coat and be safe.